Have you been to Thailand? Were you one of those tourists who were lured visiting Bangkok, being the shopping capital of the world? 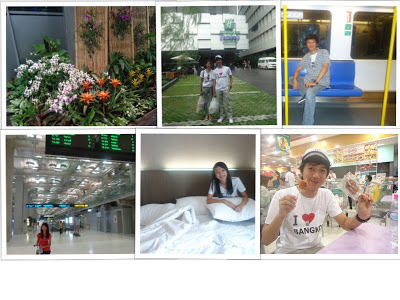 For the past months, I've been posting about interesting places that I've visited in Thailand, particularly in Bangkok. I featured interesting places like temples, museums and theme park, to name a few. But more than the place, I would say that Thailand has a lot more to offer in terms of cultural heritage. But for me, going to another country would mean a lot of opportunities to learn more about it's people and culture. I make it a point that my every travel would be a combination of pleasure, learning and experience. Thais have great respect for elders and those who are in authority. Students have high regards to their teachers and this is common in most Thai schools. Generally, Thais hate conflicts and a strong desire to please people is a hallmark of Thai's character. I also noticed that Thai's do not want to pass things over someone's head and I've done it a couple of times and I regret to have done it after I've learned that Thais considered it as a rude act. But hey, I am a foreigner and I do not understand their culture yet at that time. Later on, I learned that this is because, they considered head as the most honored part of their body and it shouldn't be touched, reached over it or point to a person's face. Since then, I avoid reaching things over one's head. Another lesson learned. If you wish to visit Thailand, I can assure you that though you may still meet some rude people around, generally, you will feel safe dealing with them as they are well mannered and disciplined people. They are always willing to help and assist whenever they can, although I wouldn't deny the fact that there are some who were rude in their dealings with foreign visitors but this only happened to me on very few occasions. Well, it cannot be avoided as this happens in every country, but I would say that my experience visiting Thailand is far better than what I used to experience roaming the streets of Saigon in Vietnam where majority of the people do not practice good etiquette. Talking very loud inside the bus, raising their feet on another's chair and turning their back when you're asking questions or direction are Vietnamese gestures that really turns me off. Glad that I didn't experience it with the Thais. Thailand's people and rich culture is just an addition to many attractions and interesting places that you will get to see once you visit Thailand, not to mention it's very modern, huge and well designed international airport and very modern transportation infrastructure which is worthy of emulation. How I wish that the Philippine government could somehow develop our transport system similar to what I've seen in Thailand. It's really very convenient and cheap to move around Bangkok as all means of transportation are available and within your reach. Foods, shopping, a great airport, modern transportation system and infrastructure, rich cultural heritage and generally nice people is something that would keep me coming back to Thailand. Both my son and daughter had expressed their desire to come back and visit the country as they have fond memories of our last vacation. So if you're planning an out of the country vacation, perhaps you could consider visiting Thailand. It's not very costly to spend a week vacation there and I assure you that granting that your vacation is well planned and organized, you will not regret your visit. We were in Thailand for holiday last Dec . We went to phuket and the kids had loads of fun at the adventure parks there. I would love to go my Mom and I really appreciate history and it would be great to teach the kids about the culture of other people. I would go for the food though. I'm a big fan of Thai food. I do not know what's in Thailand the boyfriend wants to visit Thailand in the future.. perhaps its the museum.. I love Thailand. We've been there a few times and got to look around places that are not too touristy because my husband went to college there. Love the food and of course the shopping! It's nice that you want to visit museums, I will put that in my itinerary when we visit Bangkok in March. But I doubt my hubby will like museums. hmmn, my boss is always telling us that one of the best countries he'd visited, Thailand will always be in his first. So, this means, they really have something to showcase. I have been to Thailand 5 years ago and di ko masyado na naenjoy because I am just alone and I went there for a training kasi. But I will agree with you, they are very respectful. I remember the driver of the hotel service even have to wave his hand and vow pag may nauunahan sya or something like that. If given another chance to go, I would go with my family. Is it already the shopping capital of the world? I thought people go there for operations..you know hehehe. Kidding aside, Thailand is really beautiful and definitely a tourist destination. Ah yes, our transport system has a wide berth for improvement, which is of course an understatement lol! Our international airport needs a major lift as well. I havealways heard that Thailand is the place to go! I would probably go visit there with my kids soon. thanks for sharing! Oh, we are targeting to visit the place this year. I want to go there too! But need to wait until probably 2015 for that :) Still saving up! I have been to Thailand thrice. The first time was really a tour and so we went to tourist places. The second time was a conference but we had a time to try out streetfood several times and do a bit of shopping. The third time, I was alone so I just went to places near the hotel. I will visit it again later this year. I wonder what facet to Thailand I will see. Thailand do have lots of places and foods to offer. Love that country and hope I can visit the place soon! I was in Thailand 7 years ago. The place is rich with culture and wonderful architecture. I hope to visit the country again soon. Haven't gone to any countries but in the near future I would love to go abroad and visit some of this place. I like their foods. I haven't gone to any other place outside the country except Taiwan. I agree with you that visiting a place is an opportunity to learn about the country and the people. It is nice to visit museums and parks. With those last words, I remember the gasoline boy in Saudi. My dad would say that to him every time he's done filling up our tanks. Thailand is a beautiful place. Colleagues always tell us that it's nice to go shopping there. I haven't gone to Thailand but my wife did when she attended a seminar there. She told me that it is like Manila too. Heavy traffic also occurs. But I want to visit this country too, if given enough budget. One of my dreams is to be able to travel with my husband and my children. Thailand is one of the destinations on my list but I want to see Singapore and take the kids to HK Disneyland first. A Thai stumbled upon your blog. Thailand is not different from other countries. We have good and bad people. Anyway I'm glad that you like my country. Not sure if you still work at the Thai border. If not, and if you are out of this country, welcome and be out guest again anytime. I live in Chiang Mai, another tourist magnet. It's somewhat different in culture and atmosphere from BKK or other central provinces.If you haven't been here, be our guest. Also please bring your family with you. They might love it.